This water spot remover has a strong acidic mixture that softens the hard minerals that have been left behind by hard water; especially by lawn sprinklers. 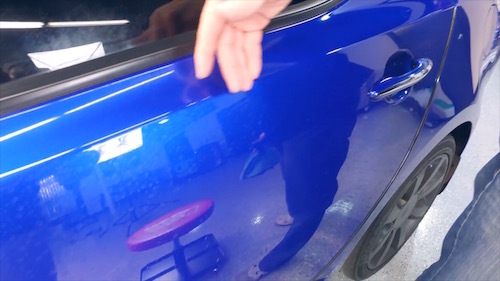 We’ve cleaned this with waterless product to try to get rid of the water stains and it’s still embedded into the paint. This is when Eraser Gel is needed. We take our eraser gel and put a dab onto a clean sponge here. Terrycloth, microfiber whatever you like. Rub it right into the surface. Try to work in a one by one or two by two section. Try not to get too aggressive. Now on the paint, you can leave it on for, depending on the environment you’re working in. If you are outside, you want to work in smaller areas, not allowing too much time to elapse while you’re doing it. Take and rub it in. Let’s sit, now we are in an enclosed environment we can let it sit a little bit longer than if you were out in the Sun. Take and we can get this whole door done here. Just rub it in. Spray it on what this is doing is neutralizing the chemical that’s used to eat out the calcium and there you go. without even having to use a buffer or compound, or polish. If you’re going to do the windows, like I said before, make sure that we only work one by one area and not allowing it to sit longer than one minute. You’ll apply it just like we did on the paint your just gonna remove it faster a little bit on there. 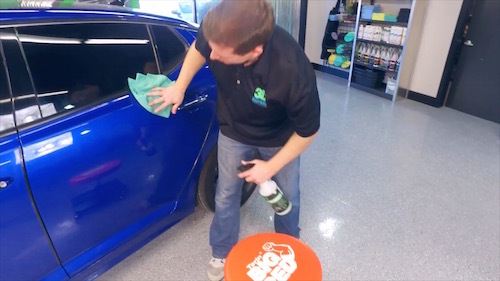 Work one window at a time or one by one area you’re doing you’re doing the windshield of the back window with a good little scrub here get that chrome and then rinse it off neutralize it with the waterless or you can use water that’s fine too. And there you go, now those water spots are history. One of the most annoying things that you may find in your car is the presence of water spots. These are faded white chalky marks across the exterior of your vehicle that can make it look horrible and also eat through the paint job. These are calcium deposits and harsh minerals from hard water conditions. The most annoying part could be the windows of your automobile. Especially when the windshield has water spots it is very bad for the visibility. 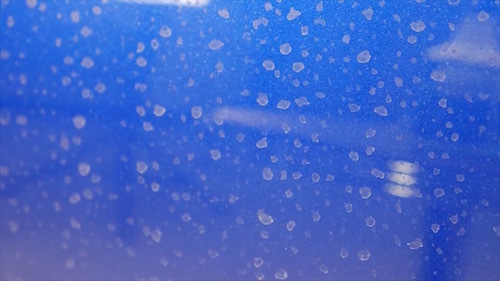 The Gel like consistency prevents the solution from running down your car surface. 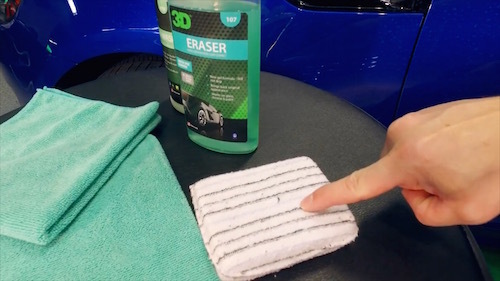 For years, 3D Eraser has been a well-known hard water spot remover among car owners and detailers. 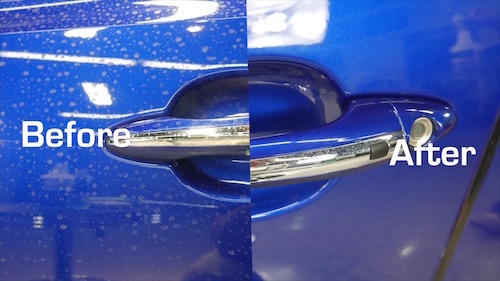 This car water spot remover has a strong acidic mixture that softens the hard minerals that have been left off by the water, especially nearby sprinklers. 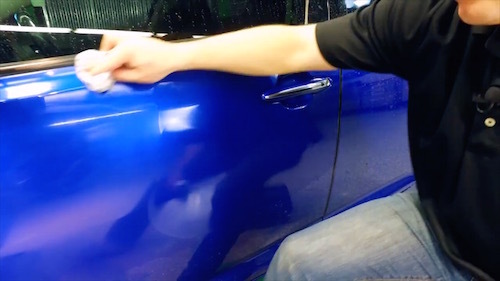 So how does a car get hard water stains? 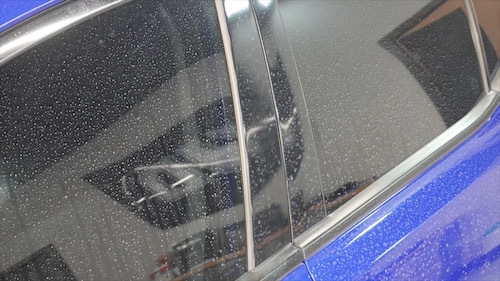 These stains on your glass can come from dried mineral deposits, acid rain, and most often when a car is constantly exposed to rainy or snowy days (which occur mostly in the East Coast or Mid-West). Winter weather habitats, don’t worry you’re not the only ones that have to face unpleasant water-spot stains; residents from warm weather climates such as Southern California, Arizona, and Nevada are also victims of hard water stains when a car is exposed to garden sprinklers. And in this case, what you need is a universal water spot remover. Water spots can also occur if someone hoses down a car with just water from a garden hose. 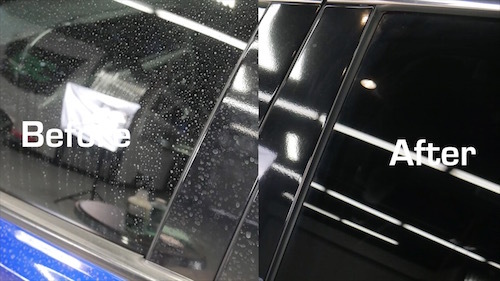 We’ve seen a beautiful Ferrari spotted all over and brought back to a metallic bullet shine by removing those ugly spots with 3D Eraser. How do I get rid of water spots? 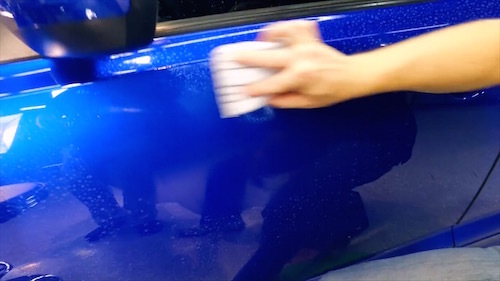 The problem with the application of regular soap and water onto the spots is that it tends to be too weak to scrape off the calcium deposits immediately and sometimes, instead of removing these tough water spots through prolonged washing your car’s paint job gets damaged. With Eraser, that won’t be the case. 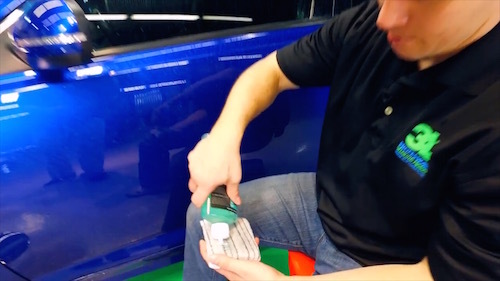 Many have tried and many will testify that this water spot remover really does work. It’s not just the effectiveness that sets it apart. This water spot remover is also quite easy to use. All you have to do is dab a little on to an applicator then to the affected area, almost like applying wax back and forth but not in circular motions and rinse it! For the proper application please read the instructions before using this product. You’ll immediately see the results afterward. What’s more is that you don’t have to worry about its chemical components. 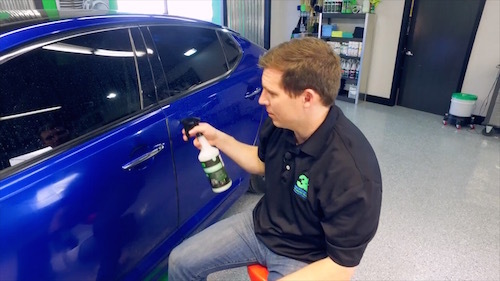 The Eraser water spot remover is made from biodegradable ingredients that will not harm your vehicle’s surfaces and if used as directed it will not in any way do any harm to the environment. Use with steel wool, very fine for eliminating water spots on windows. Superfine steel wool works best with this water spot remover for removing water spots from car windows. Do not leave on for long and apply in shade.